The Makers Empire Learning Program utilizes 3D printing technology to promote design thinking and help students become better real-world problem solvers. We transform 3D printing in the K-8 classroom, helping you successfully integrate it into the curriculum and provide all the tools you need. 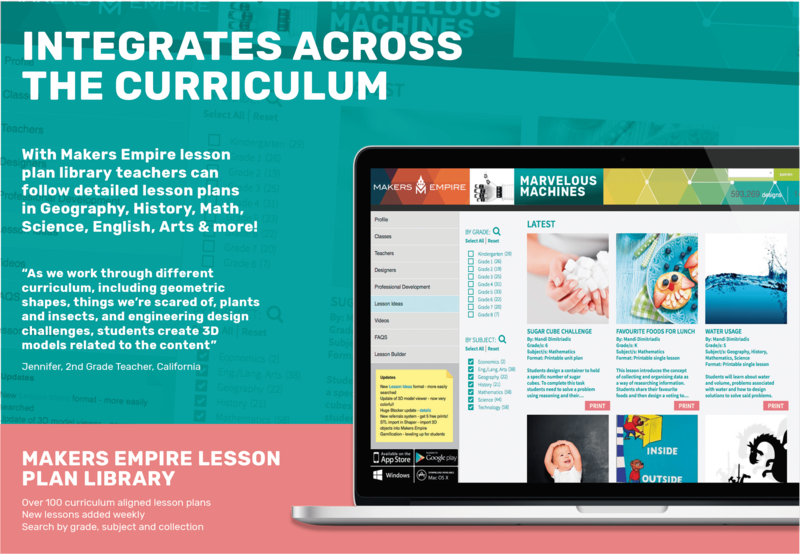 What is the Makers Empire 3D Learning Program? Pricing options for Makers Empire solutions. What is the Toshiba grant, and instructions to apply? Makers Empire helps schools successfully integrate 3D printing and design into the curriculum. We provide all the tools a K-8 school needs, including extremely easy to use 3D design software, curriculum aligned lesson plans, professional development, teacher management tools, and 3D printers if you require it. Half the schools we work with already have 3D printers, and want to make the most of their existing technology! Don’t let your resources sit underutilized. The other half of schools we help have never used a 3D printer before and need careful guidance and support to harness the power of this technology. What type of K-8 schools are looking at Makers Empire? Schools that have one to one or a high percentage of devices. And looking to better utilize existing technology. Any of these sound familiar? Great! At Makers Empire, we really like to see 3D printing integrated into the curriculum. Even if you are planning to only start with one teacher or one class, we would like to help more of your teachers bring it into their classroom experience. For example, we work with students as young as 5. In Kindergarten students can do a Hungry Caterpillar lesson plan, looking at the life cycle of a caterpillar, and then a 5 year old can desig their own 3D caterpillar at the end. 2. WHAT DO WE LIKE ABOUT 3D PRINTING? 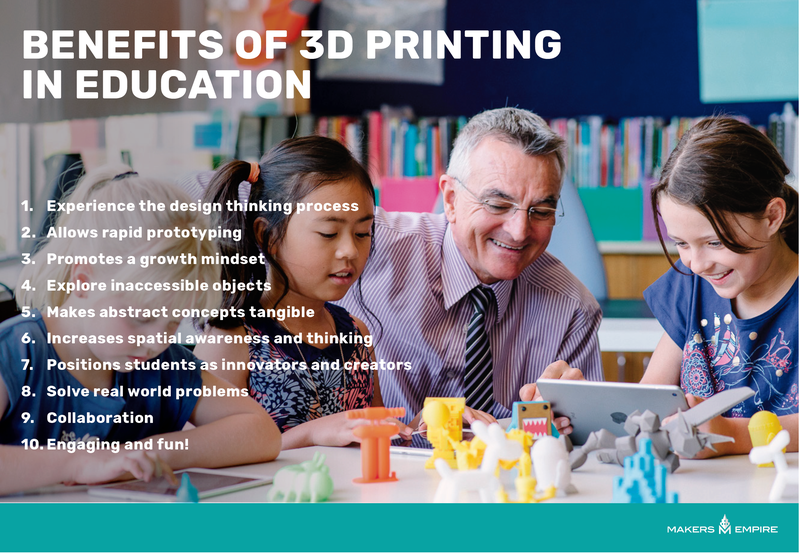 Here are some of the reasons why we like 3D printing and design for schools. Especially getting students engaged in the design thinking process to solve real-world problems. We don’t want students to just print a keychain, but be the drivers behind coming up with problems to solve. In this video example, we see students looking at people who face physical difficulties in the community, and what they can do to help? This is a great example of seeing the design thinking process in action. 3D printing and design aren’t just for science and technology class. We help teachers across all different subjects integrate 3D printing and desgin into their classroom experience. Whether it is art, history, english, there are lessons to help you! THE CHOCOLATE MOULD LESSON IS A GREAT EXAMPLE OF INTEGRATING MATHEMATICS AND 3D PRINTING AND DESIGN. Hopefully, you can see the value of introducing the Makers Empire 3D learning program into your school. Makers Empire includes everything you need to successfully integrate 3D printing into the classroom. 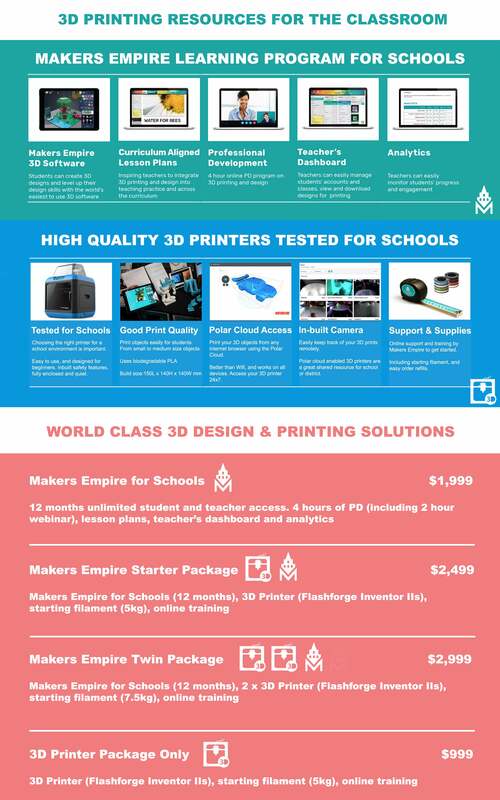 Makers Empire for Schools Solution is compatible with all 3D printers if you already have one. Makers Empire recommended 3D printers are tested for the classroom environment and have important safety features. Professional development includes 2 hour self paced video training and a 2 hour real time webinar (with one of our learning experts). During that time, they will walk you through the program, and work out a plan for best implementation. Still, have questions? You can speak to our live chat, or send an email (info@makersempire.com) to find out more.